South Africa, the worlds 25th largest country by land mass, some 1 213 090 sq. kilometres, with a coastline of 2 798 kms (1 730 miles). The entire West coast is washed by the cold Atlantic Ocean, and there is no recreational diving to be found anywhere along South Africa’s Western seaboard. Plus De Beers, the world’s biggest diamond mining company, does not like divers diving on the Western seaboard and taking their diamonds as if they were “sharks teeth”! Almost the entire East coast, from Cape Town in the south, to Kosi Bay in the north, 2 086 kms of coastline is diveable, and offers some of the most exciting diving anywhere in the world, and all within one country. What put South Africa on the dive map? Undoubtedly our sharks, even though South Africa (Sodwana Bay) has the Southernmost tropical coral reefs in the world, even more south than Australia’s Great Barrier Reef. 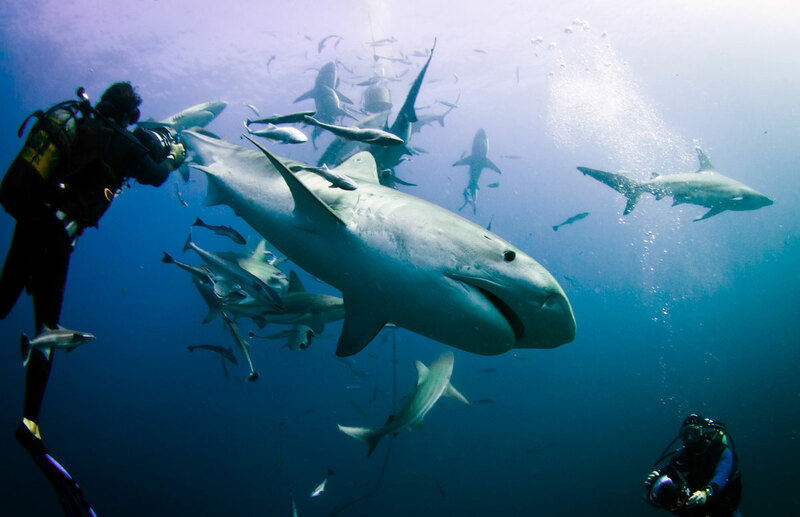 South Africa has a very healthy shark population with many different species of sharks that all dives worldwide come to South Africa in their “shoals” to dive with our sharks which include the Great Whites Shark, the Blue Shark, the Mako Shark, the Sevengill Shark (all found seasonally of Cape Town.) 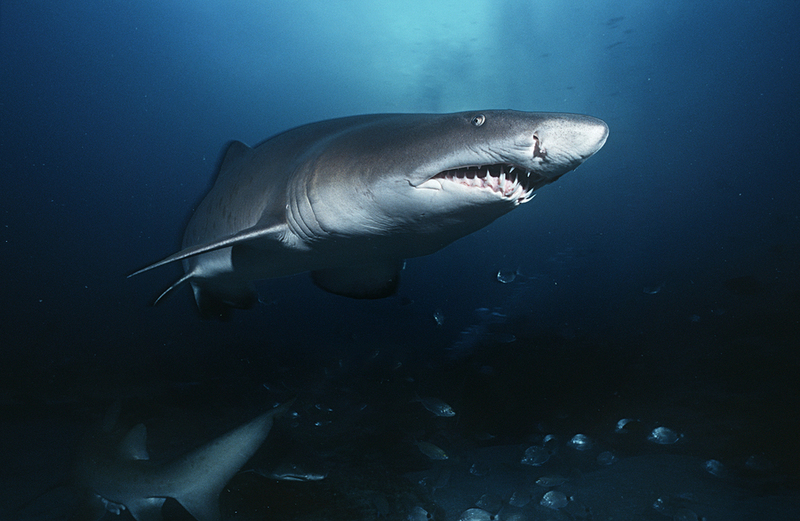 The Zambezi or Bull Shark, the Sand Tiger or Grey Nurse Shark or the Raggie as its locally, affectionately known, the Tiger Shark and the Hammerhead Shark (all found seasonally of Protea Banks and Aliwal Shoal. And last but not least, the Whale Shark, which is not really a shark, but which is found seasonally off Sodwana Bay. Dive The Big 5 offered the first commercial Great White Shark cage dive out of Gansbaai in 1996 with Theo Ferreira and his White Shark Research Institute. He/we pioneer it. Then there are our coral reefs, Sodwana Bay, and the whole of Mozambique’s coast. 3 000 km’s of it. 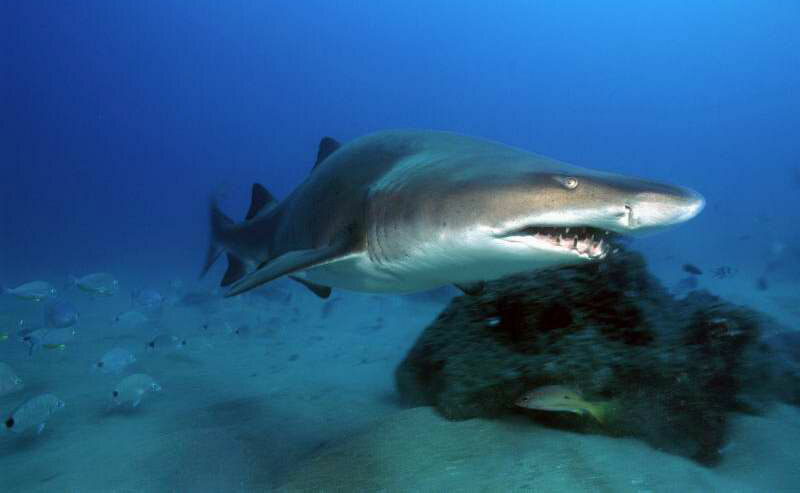 Shark diving became the main reason why divers “shoaled” to South Africa. Other than the attraction of the Sharks, South Africa has some of the best wreck diving on offer anywhere in the world, (perhaps not in the Red Sea or Truck Lagoon) and all the wreck diving can be done in conjunction with a shark dive or a reef dive. Most of the wrecks are found off the Cape Peninsula , some date back to the 1800’s and some have been purposely sunk by the South African Navy to form artificial reefs, for sea life, and for divers, and lie no deeper than 30 meters at the bottom, which makes for great wreck penetration dives. Then there are two great wrecks that sunk after hitting Aliwal Shoal off Umkomaas. This makes Aliwal and ideal. One stop dive destination, wreck dives, reef dives and shark dives. 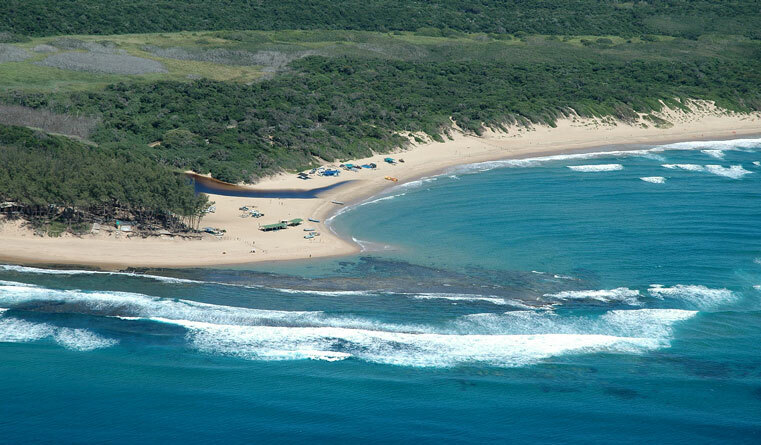 As mentioned above, South Africa boasts one of the southern most tropical reefs in the world, Sodwana Bay. 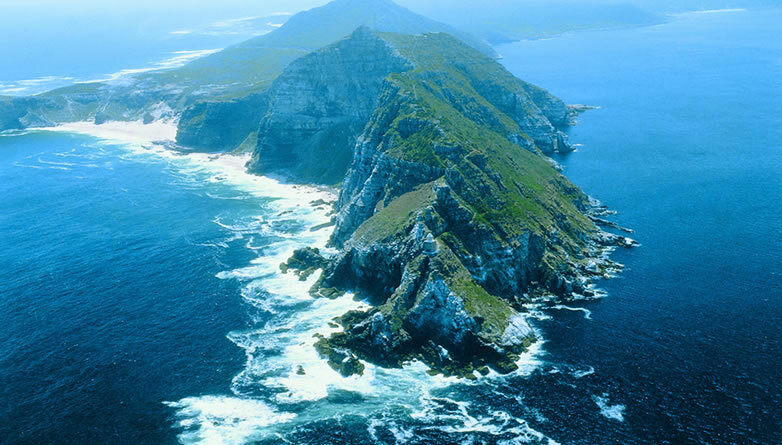 Cape Town – Cold-water 9-18° C, and the attractions are Great White (Simon’s Town & Gansbaai); Blue & Mako Sharks; Seals; kelp forests; cold-water corals reefs. 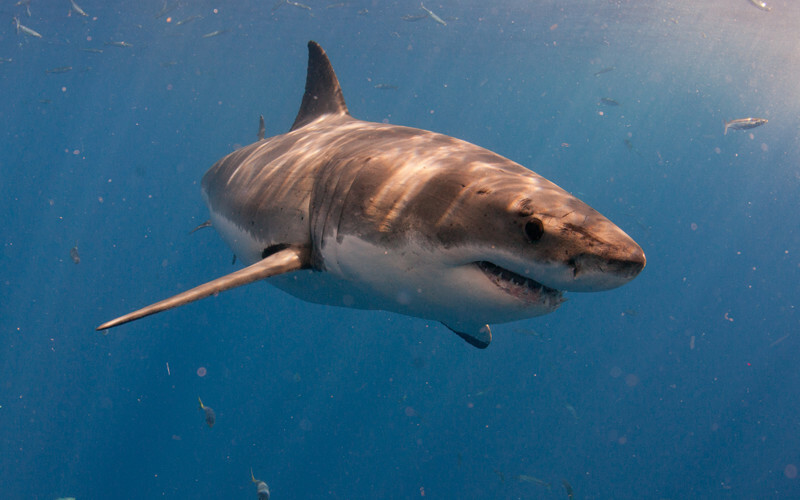 The only “real” reason for international divers to come to Cape Town to dive is for shark . Specifically, Great Whites, Blue, and Mako. In reality, the rest, wrecks, seals; kelp forests; cold-water corals; reefs, are there as an added attraction, but due to the cold water, is not everyone cup of tea, and appeals only to the most hardy of divers. Port Elizabeth – not an international dive destination. East London – not an international dive destination, except for the Sardine Run, May / June / July. There are only two full-time dive operators commercially diving Protea. Aqua Planet, the one we use, and who has a100% safety record, and another. In the past years, there have been some safely incidents on Protea Banks resulting in 3 deaths and 2 helicopter rescues. These incidents have rippled through the diving community and as a result, Protea Banks has gained a reputation as being a potentially dangerous dive site. Dives on Protea are restricted to divers with an OW2 qualification or higher doe to the depth of the dives, in excess of 30 meters, and a strong current that could be encountered when diving Protea. Aliwal – South Africa’s 2nd most popular dive site next to Sodwana. There are more dive operators in Aliwal than in Protea. At current six, four of which offer the dive shop & accommodation on site. A huge advantage. Aliwal is about 2½ km’s long with a width averaging 150 meters. Depths vary from 6 to 2 varyters (19 to 88 ft) and the shoal offers a tapestry of diversity. The Cathedral area of the reef is one of the more spectacular dives. Its inhabitants include the Ragged Tooth Shark, Loggerhead Turtle and Ribbon Tailed Rays. For the more daring diver the reef sports a landmark of international importance – Raggie Cave – one of three locations on the reef famed for its shark diving; the other two being Cathedral and Shark Gully. From July to December the Shoal is the congregation point for Ragged Tooth Sharks, where up to 60 sharks have been encountered at any one time. 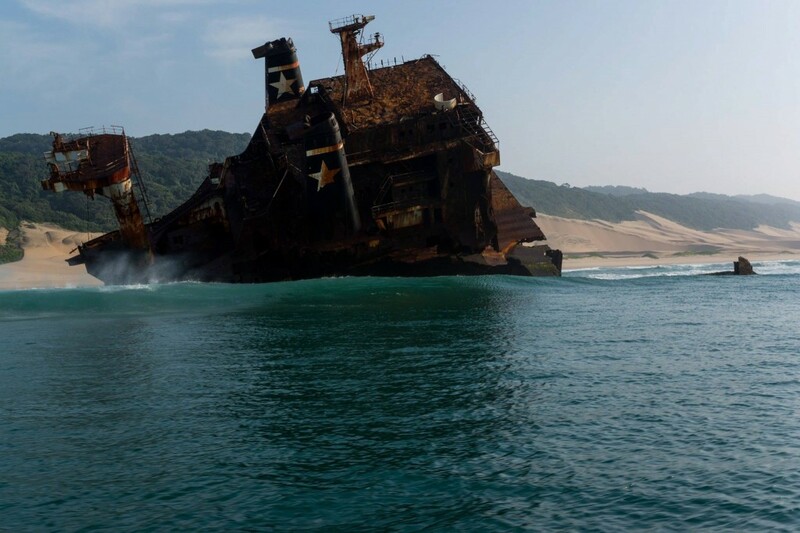 The Aliwal Shoal is not just a vivid pageant of marine life but it is also the final resting-place of two unfortunate ships, which were once ripped asunder by the upper reaches of the reef. The Produce (1974), once a 2000 ton bulk carrier, lies on the sandy bottom at 30 meters (100 ft) and its rusted framework has formed an established reef, home to many species of fish, including 20 tame Brindle Bass. The Nebo which sank on its maiden voyage in 1884 lies at 25 meters (82 ft). The Aliwal Shoal is like a magnet, inextricably drawing countless ocean species into its realm – now it extends the same invitation to you. Water Temperatures: Vary from 19° C to 25° C (66° F to 77° F). 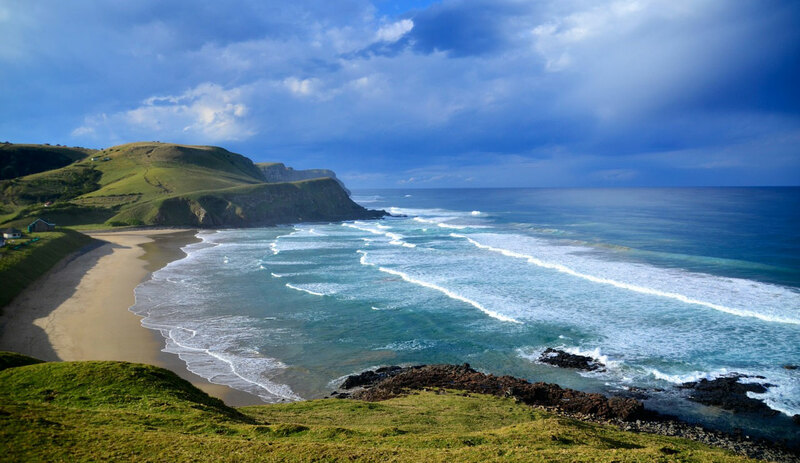 Sodwana Bay is located on the east coast of South Africa, between St. Lucia and Lake Sibhayi. 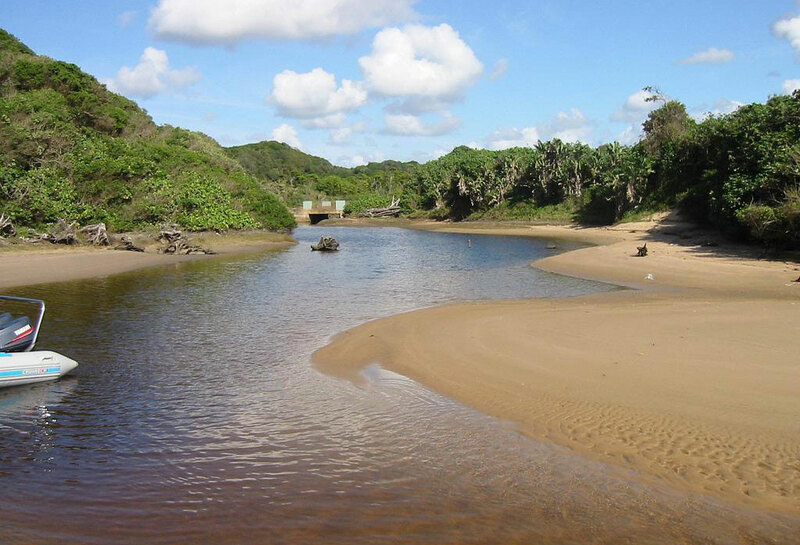 Sodwana Bay National Park is a narrow strip of forested sand dunes located along the KwaZulu Natal coast. Proclaimed a national park in the 1950s, it is frequented by anglers and divers. 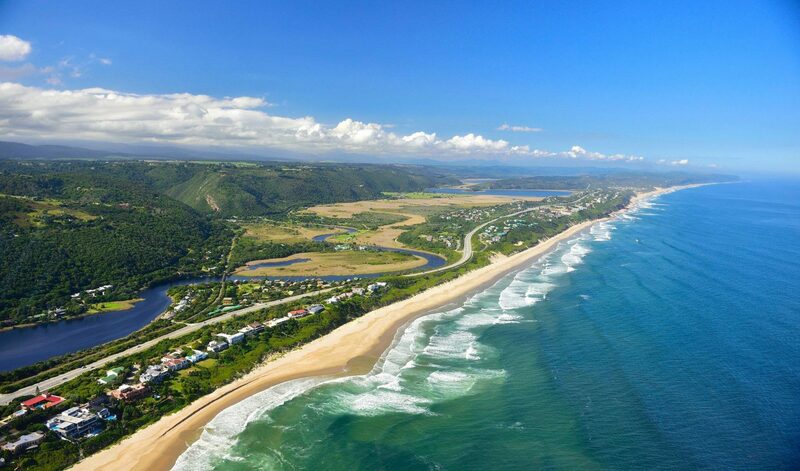 Sodwana is situated in the Maputaland Marine Reserve and the only scuba diving area along the Greater St Lucia Wetlands Park (now renamed to Isimangaliso) coastline. Classified as one of the top dive sites in the world this 50 km reef complex boasts around 95 species of hard and soft coral, sponges, other invertebrates and around 1200 fish species. It attracts 35 000 scuba divers every year. Vast 700m deep valleys, submarine canyons, are strewn over a distance of 2 km. It was in one of these that on 27 November 2000 that the coelacanth was rediscovered. These reefs are one of the southernmost coral reefs in the world and are even more south than Australia’s Great Barrier Reef. The Great Barrier Reef has 1 800 species of fish, and Sodwana, which is 1/10 the size of the Great Barrier Reef, has 1 200 species of fish, six of which are endemic to the Sodwana area. Your chances of seeing more species of fish are greater at Sodwana than on the Great Barrier Reef, due to the concentration of the fish in the area that you are diving on! 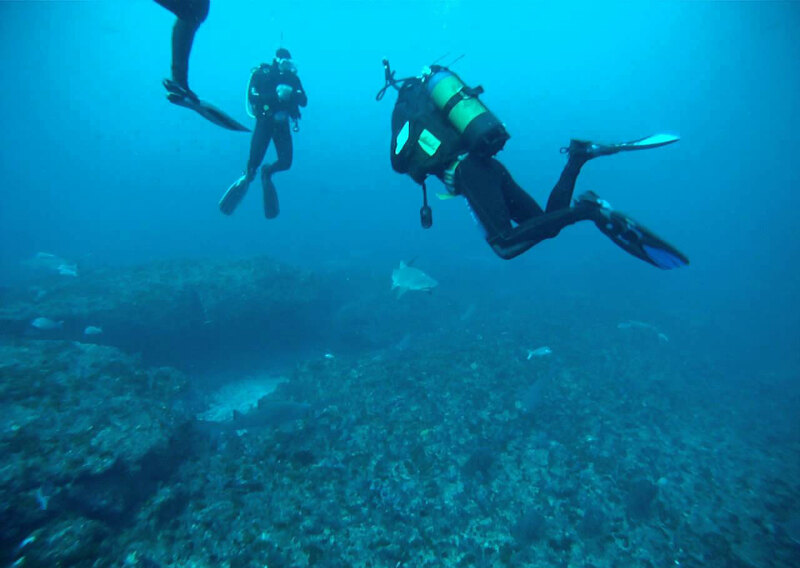 The most commonly dives reefs at Sodwana are 2 Mile Reef, the largest of Sodwana’s Reefs. Five Mile Reef, Seven Mile Reef, and the fabulous, seldom dived, Nine Mile Reef. Sodwana’s reefs are all unromantically named by the distance they are from the launch site, Jesser Point. 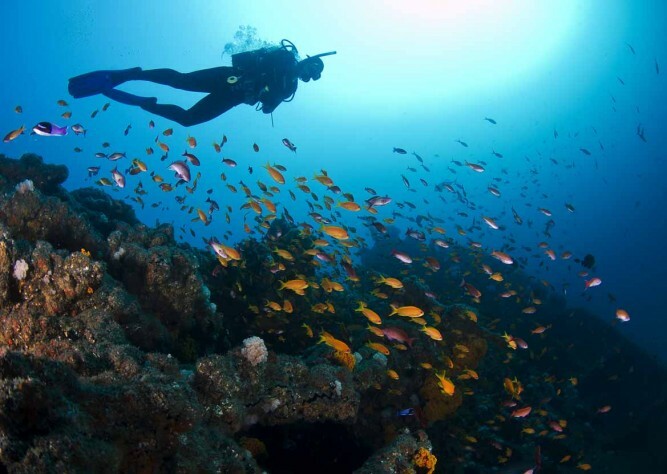 For a deep dive, Sponges is a must and is best dived on Nitrox, which is available at Sodwana. Please be advised that all diving in South Africa is best done early in the morning, just after sunrise, because as the morning wears on, the wind tends to pick up, causing a chop on the water, which makes for unpleasant and even dangerous diving. 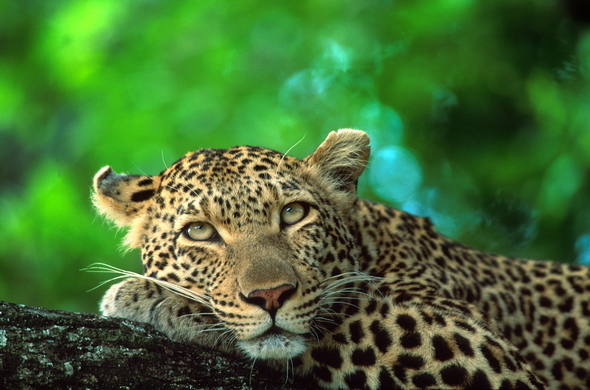 This leaves the afternoons free to explore the Isimangaliso National Park. Please don’t expect to do more than two dives a day anywhere in South Africa. Three if you are very lucky! 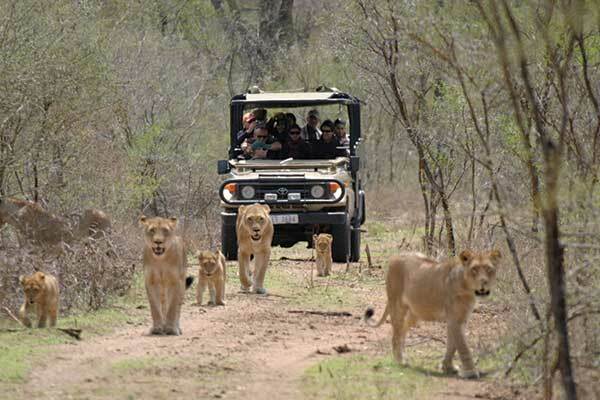 And then there are the safari options, which no other dive site, worldwide can offer.